Check out our great community events! Friday, March 1st, 2019, 7PM to 11PM was our first Cosplay Night of the year! Thanks to all who participated, the cosplay was amazing! Sunday, March 24th, 2019, was our most recent Pinball Knockout Tournament! Congratulations to our winners! We also had a pinball tournament on February 10! Thanks to all of those who participated. Congratulations to our winners! Thank you Hempzilla for supporting our awesome event! Our Ugly Sweater Holiday Party was held on Friday, December 28, 2018. Thanks to everyone who joined us, and congrats to our Ugly Sweater contest winners! December 6th, 2018 Thursday 7PM to 10PM was our Charity Pinball Tournament. All proceeds from this event were used to purchase waterproof sleeping bags to be given to the homeless to help fight off the winter chill. November 11th, 2018 Sunday 2PM to 10PM was our Pinball Knockout Tournament! Friday October 26th, 2018 was our Halloween Party and Costume Contest! This is an all ages event to celebrate the season, compete for prizes, and play some retro games all night long at a reduced rate! Cosplay, homemade, and store bought costumes are all welcome! Sunday, September 2 was our recent Knockout Pinball Tournament! The event was from 2pm to 10pm. Thank you to all the participants for making it a fun event! Friday, August 24 was our Cosplay Night! Congrats winners and special thanks to our judges! Sunday, July 22nd was our Tri-State Selfie League Finals! Congrats winners! 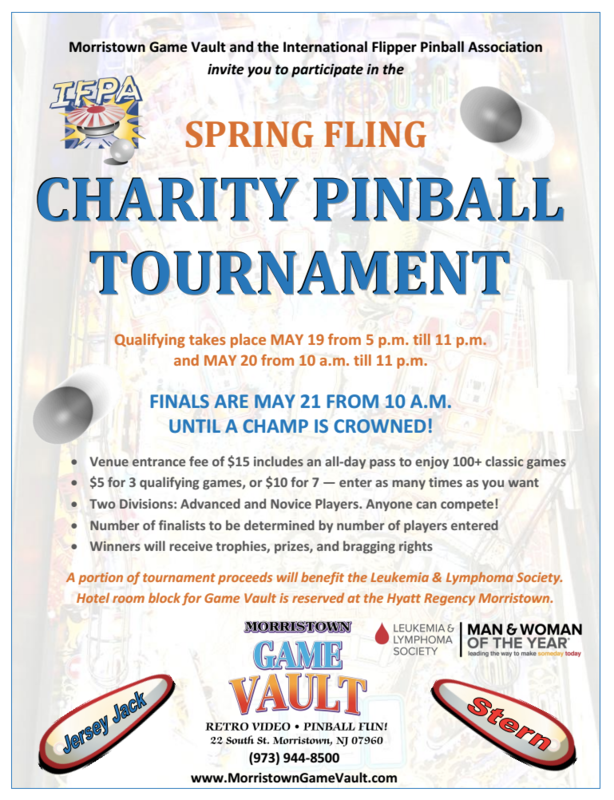 April 29th, 2018 Sunday 2PM to 10PM is our next Pinball Knockout Tournament! See you there! Morristown Game Vault would like to invite everyone to our first Cosplay Night of the year! This is an all ages event to show off your best cosplay and play some games at a reduced rate! Homemade, store bought, cosplay or Halloween costumes are all welcome! This event will be from 7pm to 11pm with a special rate of $15 for the time! The costume contest itself will be at 9pm. Winners will be chosen as a Top 3! Plus some awesome toys and swag to all three winners! You’re invited to Morristown Game Vault’s Ugly Sweater Party! Cozy up with us in your favorite ugly holiday sweater December 22nd from 5pm to 9pm. Watch your favorite holiday movies, listen to holiday music, and enjoy some hot chocolate and cookies. Sweaters are not required, but highly encouraged. If your sweater is the ugliest, you can win prizes in our ugly sweater contest! And of course play retro video games all night long for only $15! Morristown Game Vault would like to invite everyone to our last Cosplay Night of the year! SuperHeroes Unlimited will once again be hosting our Costume Contest! This is an all ages event to show off your costumes and play games. Homemade, store bought, cosplay or Halloween costumes are all welcome! This event will be from 7pm to 11pm with a special rate of $15 for the time! The contest itself will be at 9:30pm. Season Finals will be held here at Morristown Game Vault on December 3rd at 2pm! You’re invited to Morristown Game Vault’s Spooktacular Halloween Party! Cosplay, store bought, homemade, and last minute costumes are all welcome. Costumes are not required but strongly encouraged. Please keep all costumes family friendly as this is an all ages event. The event is from 6pm to 11pm with a special rate of just $15 for the whole evening! A kids costume contest will be held at 8pm and an adults costume contest at 10pm, both hosted and judged by Superheroes Unlimited. Prizes will be awarded to the top three kids and the top three adults! You can go play games and submit effective immediately. Finals at sunshine on Sunday October 22nd 2017. Morristown Game Vault -New Monthly Tournament- Four Strike Match Play Knockout. Alright guys the next season starts NOW! I submitted last sessions results expect them to post shortly. I have attached the league rules for anyone who is new or wants to look them over again. We are going to have 3 locations this season: Vault, Modern, Sunshine and the finals will be held at Modern Pinball NYC on Sunday, August 27th at 4:00 PM! dont mind notations at the end of a game on the never drains site I will clean that up shortly. Star Trek Bally is a really great game and the one at the Vault is one of the nicest i’ve seen. Same goes for the nice playing Prospector at Modern. I would hate to have to exclude them from league for an obvious reason, one that would also hinder other great games with the same possible issues in the future, how can one tell if the game has been rolled? Someone can post a picture of a low score and say they rolled it. I really like using the older games to mix it up. I spoke to Josh and have a usable solution. While these are not easy games to roll, it is certainly possible. As much as I trust you all, we cannot do honor system in this instance, and there is no guarantee there will be witnesses…so….a fun use of trying to “9 out a game” a term used for going for the machine high score for a game that can be rolled will be utilized. on these games 999,999 will be the highest possible score. Trying to achieve the highest possible without going over is actually quite skillful (see Bowen tutorial of king of steel): Meaning once you have gotten as close to 999,999 as possible you would stop shooting probably even tilt to end your game, or if you want real style points know your bonus and drain at the precise moment. If you go over without getting the picture for your submission, you’re F***ed!. Should add a fun element if anyone comes across said opportunity! Admission into the Morristown Game Vault will cost $15.00 per tournament player. At the time of admission, a player must purchase additional entries. Entries will cost $5.00 for 3 tickets or $10.00 for 7 tickets. A player who is ready to begin a tournament game will hand a ticket to a scorekeeper before starting play. Competitors may purchase additional tickets and enter as many times as they wish for the qualification period. Qualification closes and all games must be played by Midnight, Sat./Sun. To qualify for the Main Division finals, a player must get a score ranked in the top four*** on any of the 10 games. If a player gets a top-four*** score on multiple games, the highest ranked score will count. For example: If a player gets a first place score on Ghostbusters and a second place score on Metallica, the first place score on Ghostbusters will count. If a player gets top-four*** scores on multiple games of the same rank, one of them will be randomly selected as the qualifying score. For example: If a player gets first place scores on Gorgar, Space Shuttle and Earthshaker, one of these scores will be randomly selected as the player’s qualifying score. The other scores achieved by that same player in other games will be skipped, and players below will move up to fill that spot. For example, the fifth ranked score on a game in this situation would now be the fourth ranked score and so on. 40 players or the top 50% (whichever is less) will qualify for the final round. The seeding for this tournament will use the Unlimited Best Game qualifying format. On each game, scores will be ranked. 100 points for a first place score, 90 points for a second place score, 85 points for a third place score, 84 for a fourth place score, then 83, 82, 81, and so on down to 0 points for fifth place and below. Seeding for the first round of Finals will be determined by the total points earned on all games in the qualifying period. *** If less than 80 total players participate in qualifying, the amount of qualifiers will need to be lowered to accommodate the IFPA 50% qualifying rule. If between 60 and 79 total players participate, the top 3 scores on each game will qualify so that 30 players advance to the Finals. If between 40 and 59 total players participate, the top 2 scores on each game will qualify so that 20 players advance to the Finals. The Finals groups will be adjusted to accommodate this if necessary. In addition to the Main Division qualifiers, ten additional players will qualify for the B Division Finals. The players with the fifth place score on each game will advance to a Best 2-out-of-3, single elimination bracketed finals. *** Depending on the number of qualifiers in the Main Division, the B Division qualifiers may be taken from the 4th place scores or the 3rd place scores on each game. 40 qualifiers will advance to the Main Division Finals. The players with the top eight seeds will receive a bye for the first round of the Finals. The remaining 32 players (seeds #9 through #32) will play in 8 groups of 4 players in PAPA-style finals. The best seed in each group will select first, followed by the next best and so on. Players will not be allowed to wait for games before making a decision. 1st place will receive 4 points. 2nd place will receive 2 points. 3rd place will receive 1 point. 4th place will receive 0 points. After 3 games, the top 3 players from each group will advance to the next round. Seeding for the next round will be determined by the amount of points earned in the previous round. In cases where players earn the same amount of points, the original qualifying seeds will be used to break ties. 32 players will advance to the next round in 8 groups of 4 players for another PAPA-style round. The top eight players who received a bye in the opening round will receive seeds #1 through #8. Seeds #9 through #32 will be determined by the amount of points earned in the previous round. Players will select game or order based on their seed. After 3 games, the top 2 players from each group will advance to the next round. This round will be conducted in the same manner as the previous round. The four players eliminated in the Semi-Final will be awarded 5th through 8th place based on their total points. The designated charity will receive 20% of the Prize Pool. The remaining 80% will be divided among the Top 8 players in the Main Division. The top 8 Players will be awarded prizes based on their finishing position. 1st Place will receive 35% of the remaining prize pool. 2nd Place will receive 20% of the remaining prize pool. 3rd Place will receive 15% of the remaining prize pool. 4th Place will receive 10% of the remaining prize pool. 5th – 8th Place will receive 5% of the remaining prize pool. The 10 players who qualify for the B Division Final will play in a best 2-out-of-3, single elimination bracketed series of versus matches. Seeds will be determined by the Best-Game standings from the qualifying period. In each match, the better seeded player will have the choice of game or play order. The other player will take the remaining choice. The loser of the first game will have the choice of game or order for the second game. The loser of second game will have the choice of game or order for the third game if necessary. The Top 6 seeded players who qualify for the B Division Final will receive a bye for the first round. The remaining 4 players will play in the opening round. The Top 6 B Division finalists will join the final in the second round with the two winners from the opening round to make 8 total players. Playoffs will continue in this manner until we have a champion. There will be a consolation match to determine the 3rd and 4th place finishers. The winners of the B Division will receive a trophy and a prize. Rulings not covered here such as malfunctions, stuck balls, player conduct, etc. will be based on the rule set of the PAPA World Championships. Final authority for any rulings rests with the Tournament directors, headed by Steve Epstein, IFPA Representative. Tournament directors are allowed to compete in this event. If a tournament director is involved in a game that needs a ruling, it will be addressed by one of the other tournament directors. Is it possible to qualify with just one entry? Yes. If a player gets a top-four score on one entry, they will qualify. However that player will have a poor seed for the finals based on total points earned. Play more games to increase your Best-Game (“Herb Style) point total. Is it possible to be ranked high on the Best-Game (“Herb Style) qualifying list and not qualify? Yes. It is possible for a player to get all 7th place scores for example, and earn a significant amount of points in the Best-Game standings. However, that player will fail to qualify for the finals since they did not get a top four score. Is it possible to not get a top four score during the qualifying period and still end up in the finals? Yes. At the end of qualifying, people who have multiple top four scores of the same rank will only have one counted after a random selection. Scores that are skipped from other games will cause players who are below to move up in rank, as stated above in this rule set. For example: If a player gets a score ranked #8 and the top four people on that game have already qualified on another game, it is remotely possible for your score to move up four positions into the top four. This is unlikely due to the random selection of which qualifying scores players will keep, so qualify as highly as you can. Note that as players scores move up in this manner, the amount of Best-Game points they have earned will not change.